There are many benefits to the health of your pet from nutritional supplementation. 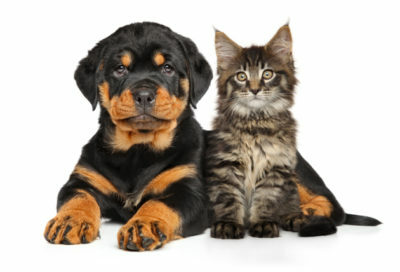 Cat and Dog supplementing can help to maintain good health of your cat or dog throughout their life. 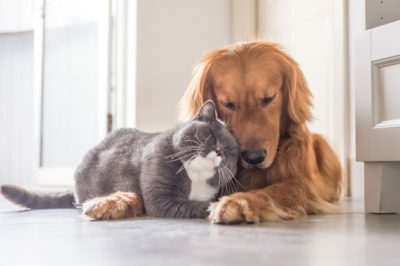 Cat and dog nutritional supplements contain different components to support the health of the pet as they go through the different life stages. Click here to find out details of how the supplements can benefit the health for your cat or dog.  Periods of physiological stress: disease, illness, strenuous exercise, transport, confinement are all forms of physiological stress that negatively impact animals. Physiological stress can lead to a supressed immune system and increased susceptibility to disease, increased requirements for anti-oxidants and a variety of other physiological abnormalities. The effects can range from decreased appetite and feed and water intake to serious medical conditions such as severe dehydration, musculoskeletal damage, respiratory disease and digestive upset to name a few. Nutritional supplements can play an important role in supporting the wellbeing of animals that have or are likely to experience these stressful conditions.  Periods of psychological stress – Horses are herd animals and are designed to graze 24 hours a day. Dogs are pack animals and have developed a pack hierarchy so that those at the bottom of the hierarchy may be bullied and may not have sufficient feed intake. 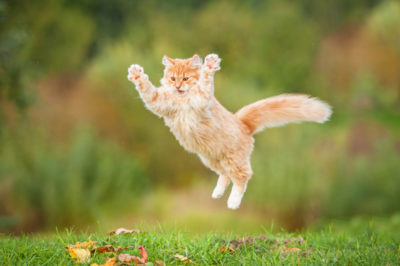 Cats are solitary hunters and are particularly prone to stress when another cat is introduced into their territory or when they are prohibited from exhibiting their normal behaviours and cannot be in control of their environment. For some animal confinement can be especially stressful. This is particularly the case for horses. These in intensive training may be confine for 12 or more hours each day, and those recovering from injury or illness may be confined 24 hours a day. Some horses do not have the mentality to cope well with confinement and may be prone to stereotypic behaviours such as box walking, weaving and windsucking. Others may develop medical illness such as colic or gastric ulcers. Nutritional supplements that support good intestinal health and provide a calming effect may benefit some animals.  Periods of inappetence – Stress, transport and disease can all lead to supressed appetites. The B vitamins, which are water soluble (and therefore not stored in appreciable amounts in the body (except for vitamin B12) play a vital role in appetite stimulation and metabolism of nutrients to create energy. A large healthy population of “good” intestinal bacteria are also key to promoting appetite and good gastrointestinal movement and function. 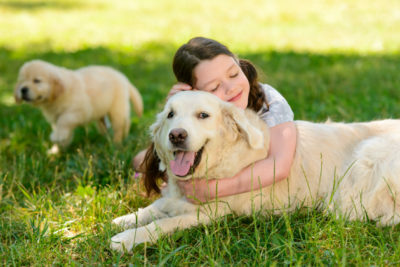  Periods of increased demand – In dogs and cats, the requirements for dietary calcium and phosphorus are increased over maintenance during growth, pregnancy, and lactation. In athletic animals such as dogs and horses there is an increased demand required to optimise performance.  Low quality diets – some low-cost diets may not be produced with the strict quality control and the content and quality of the components may be highly variable or sub-optimal. While it is preferable to feed as high a quality diet as possible. When this is not possible, supplementation is likely to be beneficial.  Certain diets: Cats fed home made diets containing raw fish, may require supplementation with thiamine (Vitamin B1) because raw fish contains an enzyme called thiaminase which destroys thiamine. Dogs fed exclusively raw meat diets contain high levels of phosphorus and low levels of calcium. Older animals may have several chronic diseases. Some chronic diseases such as cancer or diarrhoea lead to increased weight loss (because of poor appetite, poor absorption or the cancer using the nutrients). There may be increased the antioxidant requirements to protect against cell damage and increased vitamin requirements to support metabolism and appetite. 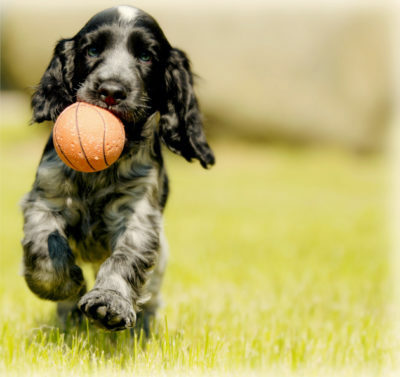  Show dogs and Working dogs. Some show dogs or working dogs my have a greater strain on their system and would benefit from taking a supplement. Just like people, pets might require additional vitamins or supplements over their life. 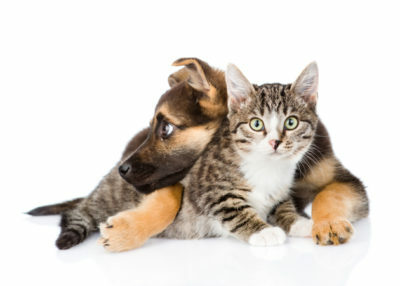 They can help your cat or dog maintain good health and performance. Nutritional supplements may contain one or more of the following components according to their intended use. Vitamins: Most pets which are fed a balanced and complete diet receive sufficient vitamins to meet their needs. However, when appetite and feed intake is reduced, intake of important vitamins is too. Pets that are fed homemade diets, raw food diets or exclusive diets (e.g. chicken and rice) may be deficient in certain vitamins and benefit from supplementation. The water- soluble B vitamins are not stored in appreciable amounts in the body (with the exception of vitamin B12) and must be supplied in the diet. Some of the B vitamins are not very stable and can be affected by extreme processing conditions. The fat-soluble vitamins (A, D, E and K) may be destroyed if the fat in the diet becomes oxidised and rancid. Vitamin A is also highly susceptible to oxidation in feed whereas vitamin E is more stable. The stability of some vitamins can be influenced by contact with certain minerals in the feed or by the heating process during manufacture. The quality of cat, dog and horse feed can vary widely and so can the vitamin content within. Because the fat-soluble vitamins are stored in the animals’ body fat, excessive supplementation (many times above the recommended levels) with vitamins A, D and E has the potential for side effects and toxicity. 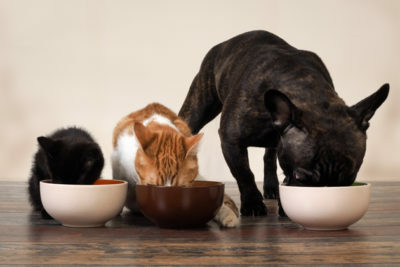 There are also some species-specific vitamin requirements, for example, cats cannot convert the β-carotene included in many commercial diets to vitamin A, therefore they require a preformed source of vitamin A in their diet, such as that supplied by liver, fish liver oils, or synthetic vitamin A.  Minerals: Most pets which are fed a balanced and complete diet receive sufficient minerals. However, when appetite and feed intake is reduced, intake of important minerals is too. Calcium and phosphorus deficiencies are uncommon in well-balanced growth diets. Exceptions may include high-meat diets which are high in phosphorus content and low in calcium content and diets high in phytates (which are antioxidant compounds found in whole grains, legumes, nuts and seeds), which inhibit absorption of some trace minerals. It is important to maintain the correct proportion of certain minerals in the diet, for example excessive phosphorus supplementation and inadequate calcium supplementation results in weak bones. Excessive calcium supplementation in large breed growing dogs can inadvertently lead to increased bone problems (osteochondrosis).  Amino acids: Amino acids are derived from the digestion of protein and subsequently become the building blocks used to make proteins in the animal. Certain “essential” amino acids cannot be synthesised by the animal and must be supplemented. For example, cats cannot synthesise taurine and require taurine in their diet. Inadequate taurine resulted in a heart condition in cats called dilated cardiomyopathy (DCM). Fortunately, most cat diets are supplemented with taurine and DCM is rarely seen in cats these days. Threonine is an important component of mucin that lines the digestive tract and protects it from toxins and invasion by bad bacteria. At time of digestive upset, the mucin requirements are greater and therefore threonine supplementation is beneficial. The digestibility of protein in different diets varies greatly. Poor quality diets are likely to contain protein that is poorly digested.  Fats: Fat in the diet is com posed of triglycerides, some of these triglycerides are essential and must be provided in the diet and are called “essential fatty acids (EFAs)”. Fats can be saturated, and less prone to oxidation when stored or polyunsaturated and more prone to oxidation when stored. Some polyunsaturated fatty acids (PUFAs) can also be essential and must be supplemented. Most feeds contain adequate amounts of EFAs but stability can vary greatly as some fats are particularly prone to oxidation when stored and must be protected. PUFAs are particularly susceptible to oxidation. The fat in the diet is important for the storage of the fat-soluble vitamins A, D, E and K. Examples of PUFAs include omega-3, omega-6 and omega-9 fats.  Probiotics: Probiotics are live micro-organisms that, when administered in adequate amounts, confer a health benefit on the host. Probiotics are understood to work in the following ways: They may compete with bad bacteria for binding sites in the intestinal wall; they compete with bad bacteria for nutrients in the intestine. They are also believed to activate the intestinal immune system to secrete chemicals which target and destroy bad bacteria and probiotics may also directly kill bad bacteria by secreting certain toxins against them.  Carbohydrates: are essentially sugars and in their simplest form is glucose which is used as a primary energy source and in they can also contain complex groupings of many sugars or fibre which must be broken down to glucose to be used as an energy source. The metabolism of glucose into carbon dioxide and water leads to the production of adenosine triphosphate (ATP) which is a molecule that functions like a battery and provides energy for the body to function.  Prebiotics: Certain carbohydrates especially fibre contain mannan-oligosaccharides (MOS) and fructo-oligosaccharides (FOS). MOS and FOS are prebiotics and they are not digested and absorbed by the animal per se but are very beneficial for the good bacteria living in the intestines and promote good intestinal health and immunity and inhibit the adhesion of bad bacteria to the intestinal wall.  Essential oils/herbs: Plant essential oils (EOs) and aromatic herbs have been demonstrated to have a wide range of antibacterial, antiviral, anti-parasitic and anti-inflammatory effects for hundreds of years. They have also been demonstrated to positively influence the host immune system Research demonstrating the exact mode of action and benefits of EOs in animals is lacking because this is a very new area of research. It is likely that EOs and aromatic herbs will become a prominent non-antibiotic alternative to managing infectious diseases.